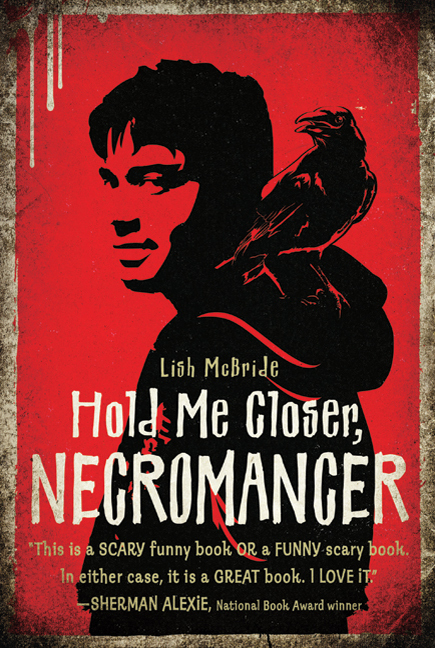 Lish McBride's Hold Me Closer, Necromancer has everything a teen could want in a book: fast-paced action, witty dialogue, conflict, sensuality, and a cast of characters that include necromancers, werewolves, witches, and harbingers (of death) living in present day Seattle. HMCN is classified as "supernatural" or "magical" fiction, and McBride uses this conceit to weave a remarkable coming of age story. Our hero, Samhain Corvus LaCroix (Sam for short) is adrift. He has dropped out of college and is working as a fry cook at a fast food restaurant. What he doesn't know is that he is a necromancer, a magician capable of raising the dead. Sam's life gets increasingly more chaotic, funny and scary as he gets caught up in the supernatural world. (Wonderful metaphor for adolescence, huh?) We are rooting for him as he finds his strength and self-acceptance. Didn't it take us all time to accept our own uniqueness? Sam shows us how our quirks and differences can become an anchor. I laughed at the predicaments Sam and his friends found themselves in, although on a certain level, they were horrific. (As Sherman Alexie says on the blurb: "This a SCARY funny book OR a Funny scary book. It either case, it is a GREAT book. I LOVE it.") Sam and his friends have to accept a friend's death, after carrying around her severed talking head for most of the book. Heavy stuff, brilliantly executed. It has been both a novelty and an enriching experience becoming on-line friends with Lish. It was a thrill to receive an advance copy of her book, in the mail over the weekend, before it's release date of next Tuesday, October 12th. First of all, she had me at Hold Me Closer. (C'mon, don't you feel the same way?) Second of all, I must admit that I am pre-disposed to like the book just because I like Lish so darn much. Her posts on Facebook always have me in stitches, her banter intelligent, crafty, meaningful and lighthearted. Those are difficult qualities to pull off in creative writing, and I was hoping to find the same qualities in HMCN. Fans like me will look forward to HMCN's upcoming sequel and be clamoring for Hollywood to knock on Lish's door. Aw, thanks friend. Yeah, your kiddos will have to wait. My man friend has one niece who's fourteen and I sent it to her (after seeing that she read other things much more scandalous) with a note at the beginning to not repeat any words she reads in my book as they will most likely get her in trouble. Also, don't you think it's funny that Riordan's new book comes out the same day? I'm so glad I don't have to compete. He'd blow me out of the water. You ever read his Tres Navarre series? (Mystery, adult lit.) I liked them--he's so good with setting. Anyway, thanks for the love. Heart-felt my friend. I could have written all about the symbolism you used too. LOVE that! I wish that my sense of humor could be as de-LISH-ous as yours! Have you always been this funny and witty? I can confirm that Lish has at least been this funny for the five years I've known her. And awesome review, Lena--it's not easy to pack all of that into a small space. And now I'm reviewing your review--I love it, and I would read it again and again! OK, now I have new words to the chorus of Elton John's "Tiny Dancer" in my head! I'll have to find a copy of this book. Thanks for the great booktalk, Lena. I'm glad you liked the post Josephine! 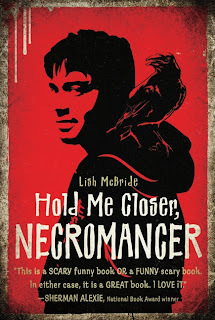 Hold Me Closer is a lovely books which writer is Lish McBride. He is very experienced writer and wrote a lot of famous books. In this post short description of the books contain and his more books list contain at besttermpapers.com which is good for those people who have good interest in books reading. There is an incredible distinction in formal and casual composition as we as a whole don't know with this. Casual are for the most part utilized when we keep in touch with somebody coolly while formal work to pay for essay writing or letters are utilized when we are speaking with somebody in formal path like for applying for some occupation or asking for somebody for something.